Previous image, 89 total items. Next image, 89 total items. Known as a playground for the rich and famous, this beautiful island in French Polynesia offers white sandy beaches, lush tropical valleys and crystal-clear water. 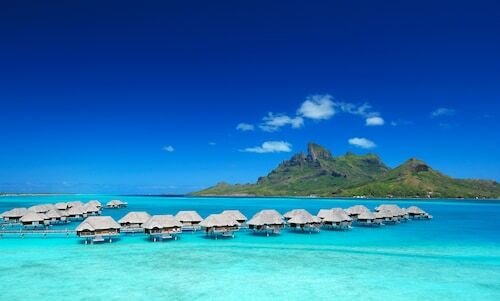 Bora Bora’s stunning beaches, lush greenery and soaring volcanic peaks make it a perfect vacation destination. Relax on the beautiful beaches, snorkel the tropical reefs or enjoy a cocktail at one of the many luxury hotels and resorts on the island. The enormous range of hotels and resorts on Bora Bora make it possible to do nothing but sunbathe and swim, but if you are looking for action, the water is the place to be. 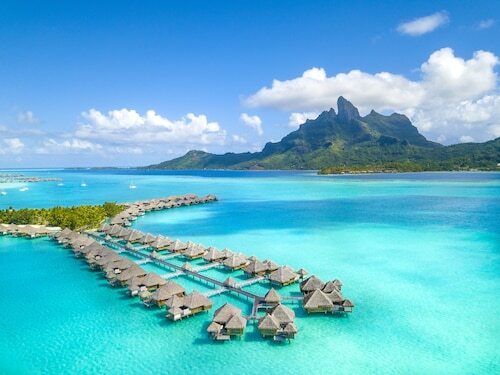 Bora Bora has both a lagoon and a barrier reef, so many water activities are easily arranged. Scuba diving is an excellent way to view the marine life on the reef, and there are many diving schools that rent equipment. Hire a boat and take advantage of the year-round game-fishing opportunities, fishing for Pacific blue marlin and mahi-mahi. Parasail over the lagoon or take a catamaran cruise across the clear, turquoise waters. See if you can spot one of the sea turtles, or, if you’re feeling more adventurous, book in for one of the shark-feeding experiences. Hire a bicycle or scooter and head to Matira Beach, which has a mile and a quarter (two kilometers) of white sand. The coral heads attract tropical fish, which makes it a great place to snorkel. Back on dry land, take a guided hike up Mount Pahia and Mount Otemanu, the two remaining peaks of an extinct volcano. You could also take a four-wheel-drive excursion along the overgrown forest roads of the island’s interior. 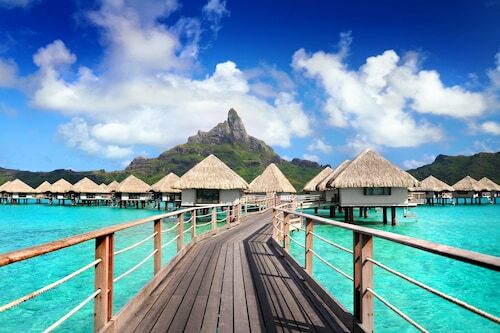 Bora Bora is also known as a popular destination for celebrities. Visit Bloody Mary’s Restaurant and Bar, a popular local hangout, and check out the bar’s wall of fame. This has the names of the many celebrities who have dined there, including Jimmy Buffet, Pierce Brosnan and Goldie Hawn. Sit back and sip a cocktail while you enjoy the atmosphere on one of the most lovely islands in the world. Indulge in the utmost in luxury on this private island where the crystal-clear waters, white-sand beaches and impeccable facilities are unforgettable. Find out why this is one of Bora Bora’s most popular public beaches when you explore its exquisite white sands, gorgeous lagoon waters and waterfront precinct. There are plenty of ways to experience Bora Bora’s mesmerizing peak, including sightseeing boat tours, helicopter rides, catamaran trips and hiking adventures. Overlooked by luxurious resorts and atmospheric bars, Bora Bora’s southernmost tip is a narrow stretch of lush forest skirted by white sands and cerulean waters. Spend days lazing by the lagoon framed by magnificent Mount Otemanu and explore the waters with your snorkel and mask and visit a turtle sanctuary. The gateway to the village of Vaitape provides premium access to Bora Bora’s exquisite beaches, reefs and lagoon-side islets and has a busy marketplace. Enjoy easy access to Bora Bora’s gorgeous beaches, atmospheric restaurants and the town of Vaitape from one of the island’s original luxury resorts. Discover the amazing array of marine creatures that live below the surface of Bora Bora’s beautiful lagoon at this natural aquarium on a small islet. Located in Bora Bora, this beachfront resort is on the boardwalk and within a 5-minute walk of Pearl Resort Beach and White Valley. Nestled on the beach, this Bora Bora resort is within 6 mi (10 km) of Bora Bora Photo Lagoon, Matira Beach and Le Meridien Beach. Mt. Otemanu and Matira Point are also within 6 miles (10 km). Nestled on the beach, this Bora Bora resort is 0.1 mi (0.1 km) from Le Meridien Beach and 0.8 mi (1.3 km) from Bora Bora Photo Lagoon. Matira Beach and Mt. Otemanu are also within 6 miles (10 km). 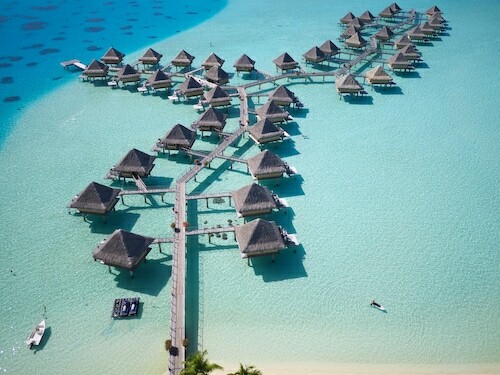 Situated in Bora Bora, this hotel is 0.8 mi (1.3 km) from Vaitape Harbor and 2.3 mi (3.7 km) from Mt. Otemanu. Tupitipiti Point and Mt. Pahia are also within 3 miles (5 km). Nestled on the beach, this Bora Bora resort is within 6 mi (10 km) of Bora Bora Photo Lagoon, Le Meridien Beach and Coral Gardens. Mt. Otemanu and Leopard Rays Trench are also within 6 mi (10 km). Nestled on the beach, this Bora Bora resort is within 6 mi (10 km) of Matira Beach, Motu Piti and Matira Point. Coral Gardens and Mt. Otemanu are also within 6 mi (10 km). 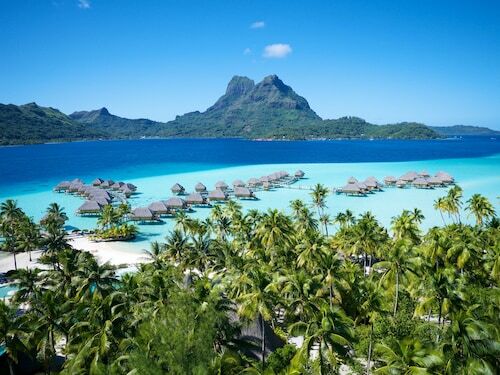 Nestled on the beach, this Bora Bora resort is within 1 mi (2 km) of Motu Piti, Matira Beach and Matira Point. Moti Piti Aau Beach and Coral Gardens are also within 1 mile (2 km). 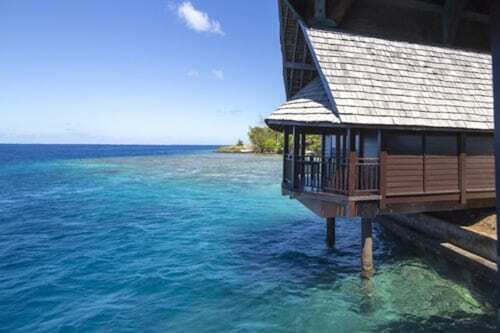 Nestled on the beach, this Bora Bora resort is just steps away from Motu Piti and Matira Beach. Matira Point is 0.2 mi (0.3 km) away.